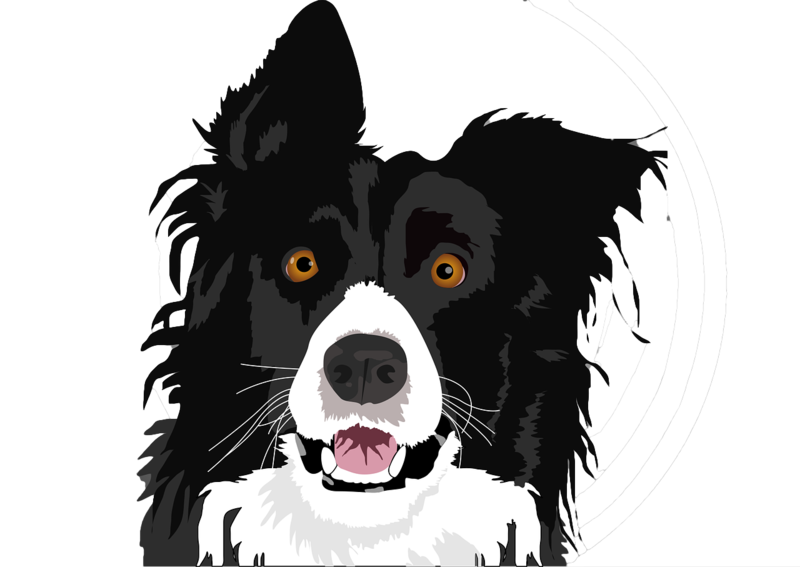 So far in this series you have taught your dog to 'look', to 'catch', to side-step left and right using his back end, and to tuck into a sit when coming into that front. You are no longer using your hands or a clear stick to guide or adjust him. You can finally say with confidence that your dog understands the concept of what a front is! Now you need to incorporate maintaining that knowledge and precision into your regular training! Have the dog 'pass' through your legs, and once he is through, step back and ask him to 'Front'. It really doesn't matter whether your dog goes through your legs from the front or comes in from behind: if he passes through your legs from in front of you, after he has gone between your legs quickly turn around, stand still and say 'front'. If he passes between your legs from behind, take a small step backwards after he is all the way through and say 'front'. With your dog in a sit, tell him to 'stay' and step back 2-4 strides (depending upon the size of your dog--shorter distance for small dog, larger for large breed), then take a large step parallel to either the right or left. (You're going to work both sides, so which direction you do first is your choice.) I like to rev my dog up a bit, so at this point I will incorporate my 1,2,3 game ("Play" Chapter in my book: see ad) or do a 'Ready, steady' taunt to get him a tad amped. I will then say 'front'--and expect one! Work one side 2-3 times, then play a bit. Repeat the entire process going to the other side. I find the repetition on one side before switching and working the other ultimately has better results than continually alternating left and right directions. Hint: Your eyes are extremely powerful. Do NOT turn your head and guide him with your eyes as he will no doubt sit 'wherever' the moment he reaches you. Rather, look at the spot where you want his rump to land. a. On occasion I will whip out an hidden toy at the last moment and toss it between my legs, allowing my dog to run through my legs rather than have to sit. It's important that the dog never know if he's going to pass through or have to front until that last moment. Timing is everything! b. As my dog is approaching me on any type of recall and gets to about 5 feet away, I will start backing up while reminding him to look. Once he reaches me (and he is going faster than I am, so it's going to happen! ), I will take one short step toward him and remind him to front. This forward step results in a quick, sharp sit---which is precisely what I want! Naturally I won't treat every front, but I certainly will praise. Praise is my dog's PRIMARY REWARD! After doing a few 'fronts', I will absolutely bring out a toy and interact. Now it's time to remove the treat from the dog's muzzle and have the dog start looking up at your face as he is coming into that front. (refer to: Teaching the Front, Part 1: What is a 'Front'?) This can be a tad tricky. Be patient during this process and remember to always be there to help your dog succeed. 1. You will now move the hand with the treat upwards, holding it close to your body and in a line between your eyes and your dog's eyes. Praise the 'look'! 2. Your dog is still in a stand before you. 3. The clear stick will be held in your free hand, hanging naturally at your side. 5. Say 'front' as you move. Hopefully your dog will move with you. If he does not, you can move the hand with the treat closer to him (but NOT to the muzzle) and lure him to the front, bringing out the clear stick and tapping his back end as you do this. 6. If your dog does move with you, but his back end is slightly off center, bring out the clear stick and tap his back end as you remind him to 'front'. 7. Once in front, draw the cookie upwards towards your chin as you say "Sit". Make sure your dog does a tuck sit and not a rock back!! The tuck sit will keep the spine straight, assuring a straight sit. 8. After he is sitting perfectly in front, pop the treat into your mouth, drop your hands to your sides, praise your dog, and spit him the treat. Next time we'll look at some of the games I use to keep these fronts fine tuned. Once my dog understands how to maneuver his back end and has heard me say 'front' in conjunction with this movement a kajillion times, then I begin the process of removing my hands from in front and dropping them to my sides---the ultimate picture my dog will have whenever he comes to front in the ring. (The Obed. Regs are quite clear on this: hands must be hanging naturally at sides when a dog comes to front.) I do this initially by using an arm extender: a clear stick. The clear stick is simply that: a thin clear length of plastic (a wand, if you will) that I will use as an extension of my arm to tap and so indicate to my dog what he has to move. Remember: the clear stick is used to INDICATE to the dog what to move. We tap (touch) the area that needs to move to help our dog learn and understand how to succeed! These sticks can be purchased at any store that has venetion blinds. ( It's the plastic wand that opens and closes these blinds. ) Too, for those who have small dogs, most drapery and blind stores can have these wands custom made to suit any length you may need. The first thing I recommend doing is introducing your dog to the clear stick. Let him sniff it, pet him with it, even let him carry it around if he wants. We don't want him to worry over it. 1. Have the treat still centered in front of you, but only in one hand. Hold the clear stick in the other. The dog is still in a stand perpendicular to you. 3. The dog's head will undoubtedly follow the cookie. (If you lose your dog's attention, abort and start over. DO NOT TRY TO TEACH A FRONT IF YOUR DOG IS NOT PAYING ATTENTION!) As you say 'front', TAP your dog's rear foot with the clear stick. TAP ONLY. Do not push. Your goal is to indicate to your dog what needs to move, not force the issue. 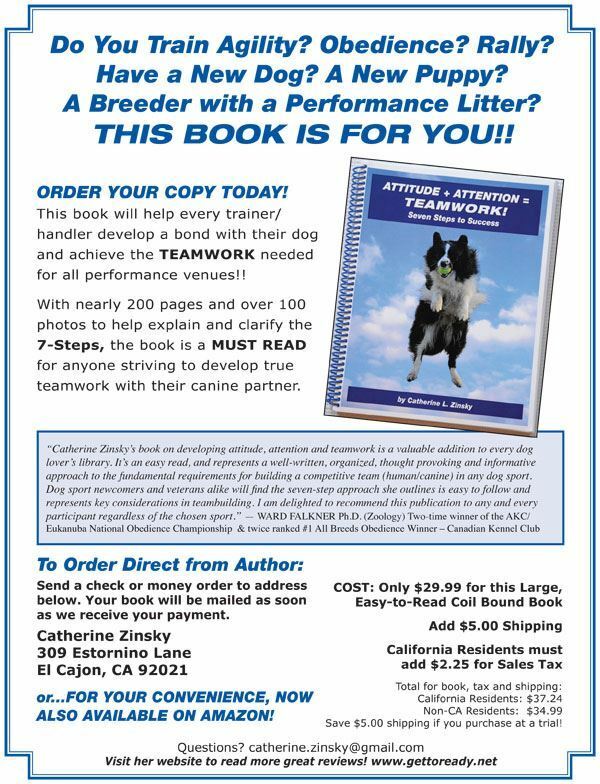 Let your dog do the work! 4. Once the dog is standing in 'front', praise him! You can repeat this process 3-5 times, then praise again, reward, and play with your dog. 5. Reverse direction and repeat the above process. Why Heel to a Metronome? A metronome is a device that marks time either audibly or with light ( usually flashes). Musicians use such an apparatus to great effect, especially during their puppy learning stages when they are developing their ability to understand cadence and rhythm. Using a metronome keeps them constant and in beat. Through this procedure an understanding and appreciation of tempo and smoothness is acquired. One of the more antiquated--though nonetheless functional and effective--metronomes is a standup type with an arm that moves back and forth in beat to the rhythm it is set for. 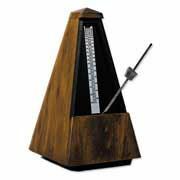 This metronome can be placed on the piano or near any music stand and the student can listen to the cadence and play in sync to that rhythm. This greatly enhances the promising musician's ability learn about timing, control, and smoothness. So, too, is this applicable to competitive obedience heeling. Learning to move in sync with a metronome is like learning to dance to music. Keeping a constant, rhythmic pace while heeling gives the whole team picture grace and elegance. It also enhances the partnership of the handler and dog, much as dancing in time to music unifies a dance team: the dog and handler, the two dance partners, flow as one. Too, learning to heel with a metronome helps you become skilled at consistency in movement. You will learn to maintain a particular rhythm and stride length that best suits your teamwork. This offsets the unconscious slowing down or erratic, jagged pace sometimes seen in teams during heeling. Learning to heel with a metronome helps keep your heeling smooth and even. Despite fears, anxieties, and other stress-related pressures that a handler might feel in the ring, the muscle memory learned during practice with a metronome will kick in and greatly aide the overall performance. There are many styles of metronomes to choose from. 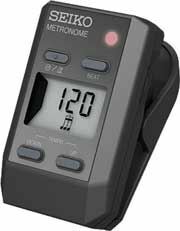 Years ago I purchased a clip-on Seiko® brand metronome from a music store. I especially like this one because it is light and I can clip it onto my breast pocket or collar. It's also extremely simple to operate in these days of high tech (a world I am often baffled by!) I'm delighted to tell you that this un-high tech device is still available on line. Naturally there are many free metronome apps available for your android phone as well. I, myself, am using "Metronome Beat". Please understand that I am not advocating this app over others; it's merely the one I happened to download first and found it quite satisfactory. Now comes the more difficult part: setting the metronome to a beat that is most suitable and comfortable (!) for you and your dog. There's no 'fixed' metronome beat that is the best for heeling in obedience. What you ultimately choose is going to be the beat that pushes you a bit (meaning keeps you at a somewhat brisk pace) without making you feel rushed or winded. When introducing my students to the metronome, we play with it. I generally start the team at a higher beat, see if it's appropriate--meaning do they look good at that pace--then ask the handler if it is comfortable. If not, we move down a notch or two until we find one that not only keeps the team moving nicely, but is a pleasing pace for the handler to maintain. Generally--and again, this is not 'fixed'--a good beat to set the metronome at is between 128 to 135. I, myself, use a 133 beat. And I've used this beat with my Dobermans, Cattle Dogs, and now my Border Collies. It's the pace that "I" can comfortably maintain and still have the heeling with my respective canine partner look smooth. Naturally this beat does not apply to the 'slow' or 'fast' pace in heeling. This beat is only used for the 'normal' pace in heeling, but should be resumed upon coming out of either the 'slow' or 'fast'. When first practicing and learning with a metronome, I recommend that you only heel at a normal pace until that rhythm becomes natural to you. And you needn't initially even heel with your dog! Heel alone to the metronome beat. Once you're comfortable with 'hearing' and 'keeping in sync' with the metronome, then invite your dog to join you. Wishing you all smooth heeling!! It is my contention that true teamwork between a dog and handler requires a solid understanding of eye contact--and that goes for both parties! It is not just important, it is indispensable. With some dogs eye contact comes easily, with others not so easily. My Border Collies depend upon it, but I remember my Cattle Dog, Derby, had a difficult time accepting eye contact as a puppy. She would avert her head and turn away. Eventually she grew to understand that eye contact was not a threat, but a communication. If you want a true team partner, it's imperative you communicate: and the eyes have it! I once saw a cat show at the Wild Animal Park in Escondido, Ca., (now called Safari Park) where the trainer used only his eyes to instruct the cats. It was amazing. This trainer spoke to the audience via his mike, but used his eyes to direct the cat's behavior . Naturally all of the behaviors were inherent, nothing untoward, but nevertheless the strength of eye contact was powerfully apparent. Teaching eye contact is actually rather easy, but like much in training, it takes patience, practice and consistency. Begin close. Begin by sitting in a chair and having the dog sit between your legs. (With a small dog, you can sit on the floor or put the dog on a raised object, such as a grooming table.) With a treat held by both hands in front, take it to the dog's nose and draw his eyes up to yours by bringing the treat up to your face while giving a cue word, such as 'Look'. When he looks, praise and give him the treat. As the dog's understanding develops, you can put the treat in your mouth (I use string cheese) and simply tap your temples as you say 'Look'. ALWAYS PRAISE! You want your dog to work for you, not the treat. Praise should be your primary reward. Now stand up. This greater distance between your eyes will initially make success more difficult, but not insurmountable. Once again shorten the time you ask for eye contact so that your dog can make the transition more easily. Once established, again begin lengthening the amount of time you hold each other's gaze. Praise, talk, praise! You want your dog to WANT to look, not just have to. Now that your dog understands 'Look', add movement. What I like to do is make a chute with my Broad Jump boards, only wide enough for my dog to walk through. I put my dog in a 'wait/stay' at one end and situate myself about half way within the chute . Touching my temples and making eye contact, I say 'Look', then say 'Come' as I slowly back up. Note: I will have either a treat in my mouth or a toy under my chin. In these beginning stages I will absolutely help my dog succeed! When my dog reaches me I praise copiously and reward with a treat or toy and a great deal of hands-on petting. The chute, by the way, keeps my dog coming in straight, and later when I ask for a front/sit, the chute will help it be correct. Again, I try to do as much as I can for attaining the picture I ultimately want. Once my dog understands this game, I extend the distance between us. That my dog be looking at me as he comes in for any obedience recall puts the odds greatly in my favor that he nail his front. It also indicates that he is not being distracted and that he trusts in me. Both are essential for our performing as a team. Teamwork requires that the members work in unison. In Obedience verbal communication is limited, as is unwarranted body language. But we still can make visual contact! We can smile with our eyes, reassure, build strength and confidence, let our canine companion know he is not alone, guide. We're a team. MAY YOU ALL FIND TRUE TEAMWORK AND GREAT SUCCESS! The next step after teaching your dog how to perform a kickback stand (see November, 2016 F&F issue, Part One:) is to teach your dog to stand and stay in place until released. No doubt about it: this is the more difficult feature of the Stationary Stand Exercises. Some trainers only teach the stand/stay AFTER the dog understands a sit/stay. I do not. I distinguish between the two and separate them in my training, but I will teach a stand/stay often before even beginning a sit/stay. I always begin by teaching my dog to stand and stay while I am still very, very close--close enough that should my dog decide to move any one of his four feet, I am on it immediately! Being close and being on top of any movement is critical. It is in these beginning stages that the idea of moving even one paw is discouraged and ultimately understood. Believe me, it's far too late to teach a dog to not move a foot when you're already 20 feet away. Stay close initially. Build your dog's understanding and his confidence! 2. Once I've placed each foot, I then stand up and return to heel position. 3. Next I put some pressure on the withers, lightly pressing downward as I again remind my pup to 'stay'. 4. I then stand back up. 5. After a short count of 3-5, I release my pup with praise and reward. 1. I repeat steps 1 thru 4 above, then give my dog a signal and verbal 'stay' command (as I would in a formal exercise). 2. I would then place my left hand on my dog's brisket (the front of his chest) as I step forward out of heel position--one stride only!--and turn to face my dog. Hand is still on his chest!! My job is to teach my dog while showing him how to succeed. Initially I will try my darnedest to not allow him to make any mistakes. 3. With my hand still on my dog's brisket, I will take the leash and gently pull forward until there is light tension on the leash. Be mindful that the leash is pulling straight forward under the dog's chin. Do NOT pull upwards, as the dog will want to sit. Nor should you pull to one side or the other, as this will throw the dog off balance. 4. Once I 'feel' through the leash that my dog is bracing (and this may take a few training sessions), I will lift my left hand back and away slightly from the chest while still keep the tension on the leash! This will give my dog the opportunity to move a foot...or not. 5. Should my dog move a foot the response is straightforward: I simply lightly tap the offending appendage with one finger to indicate to my dog that this is what I am referring to as I say 'uh-oh' and place the foot back where it was. I then remind him to 'stay' and resume the tension on the leash. I believe it's important that I let my dog know WHY I am saying 'uh-oh' by tapping the foot that moved and replacing it. I am being clear and definite. There is no gray area. I am letting my dog know precisely what he has done that is not desirable. And because my dog desperately wants to please me (just as yours does you! ), he will learn quickly and easily without being traumatized! 6. Once my dog is standing and staying in place without any signs of wanting to move any of his feet, I then take my left hand entirely away from his chest. I am still close and the tension on the leash is still maintained, however. But now I am standing upright. 7. While still close (I need to stay on top of any potential movement, so I must continue to be near enough to right any movement my dog might make. Again, timing and proximity are important), I can now begin stepping to the left, then to the right, making the arc larger as my dog continues to progress with his understanding that he must not move even though I do. This step is also a precursor to my being able to walk around and behind him and so return to heel position--an action that is required in the Novice Stand for Exam. 8. Once I am able to walk all the way around my dog in both directions (! ), I will drop the leash and go out the requisite distance for the particular exercise I am working on. Once my dog understands how to succeed on a short leash, I can then go to a 6 foot leash and ultimately to a 23 foot retractable lead, especially when teaching the stand/stay for the Utility Signal Exercise where the handler will be 40 to 50 feet away. Often parting any distance 'makes the heart grow fonder,' and a dog will move toward his handler for security purposes. Using a retractable lead in conjunction with the tension--which the dog fully understands by now!--is a marvelous approach to offsetting any future movement. WISHING YOU ALL THE HAPPIEST OF HOLIDAYS AND AN OUTSTANDING NEW YEAR!! The Figure 8 is unquestionably the most compact portion of the heeling exercise. It incorporates turns, three different paces (fast, slow, and normal), and two halts. All of this is accomplished in a condensed area around two human strangers. The Figure 8 can be a daunting exercise, and in the opinion of many trainers and exhibitors is very difficult to perfect. Certainly it’s an exercise that is all too often underestimated. Generally the Figure 8 comes at the end of a heeling pattern, though in Open B and Preferred Open the Figure 8 can on occasion precede the heeling pattern, depending upon the order chosen by the judge. When it is time for a team to perform the Figure 8, two strangers will enter the ring and go to a prescribed area and situate themselves 8 feet apart. These two strangers are two ring stewards---who are volunteers, by the way, so be especially nice to them. They will stand facing one another, and in this capacity are generally referred to as ‘posts.’ They are human posts who will stand still and silent while you and your canine partner perform the Figure 8 upon the judge’s orders. You will set up midway between the stewards on the opposite side of the judge. In other words, you’ll be facing the judge on the opposite side of the 'posts' . Btw, "midway between" the stewards does not mean that you set up directly in the middle of the two stewards, such that if you raised your arms on either side you’d be waving at their noses. This position would put you at a distinct disadvantage, as you would have to heel directly into a left or right turn on your very first step. ‘Midway between’ simply indicates that there should be an equal distance between each post and you. You’re centered, but at some distance back from the posts. Optimally it’s best to stand approximately two strides back from that center point between the two stewards. This allows you to take two straight strides before having to begin the turn around one of the posts. These two straight strides assist your dog into getting into the swing of things and often prevent potential bumping or lagging. When beginning the Fig.8 you may choose to go in either direction. The judge is no longer required to remind you of this. You are supposed to know. But it’s important that you be aware that the decision as to whether you begin the Fig 8 by going around the right post or left post first is entirely your choice. It's important to recognize that the three paces—the fast, the slow, and the normal—are executed by the dog, not the handler! These three paces are a natural consequence to heeling in an '8' configuration. Should you elect to go around the post to your left first, the dog will obviously be between you and the post as you go around the steward. Because of this ‘inside’ position, your dog will necessarily need to slow down in order to maintain heel position. If he doesn't slow down, he will be in a forged position. This is then the ‘slow’ pace I’ve been discussing. Conversely, when going around the post to the right, the dog will be on the ‘outside’ and will need to shift into a faster pace in order to keep up with you in heel position. This is the ‘fast’ the judge is looking for. 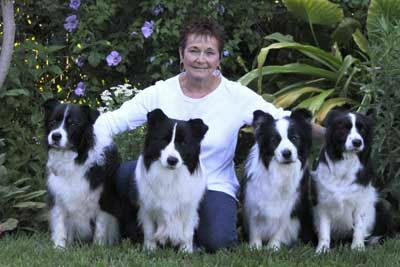 It is important that you, the handler, sustain an even, rhythmic pace to best assist your dog in these changes of pace. Just consider: if you slow down around the left (inside) post to better support your dog, you’re actually making it more difficult for him: he now has to go even more slowly than ever! Nobody’s fooled, believe me. Not even your dog. Keep your pace even. It must be brisk, but does not have to be as brisk as you would walk for a regular heeling pattern. The Figure 8 would be very difficult to execute at a standard brisk pace and would probably end up looking choppy instead of smooth. Think of driving a car. On a straight stretch you can go 80 MPH, but out of necessity you have to slow down a bit to take that cloverleaf off ramp. It’s just natural. So, too, is this true with the Figure 8. You need to shift gears a bit in order not to burn rubber or have a fender bender with your dog! I work very hard with my students teaching them to silently count as they’re practicing the Figure 8. Counting forces the handler to walk at an even pace around each post. The beat depends on the team, of course, but the act of counting makes it smooth. You might want to try this. Now let’s talk shoulders. Boy…I can’t tell you how often I see that left shoulder thrown back on the inside (left) turn, then yanked way forward for the outside (right) post. A discerning judge is going to nab you for handler error. You can bet your blue ribbon on that! Natural, folks, natural. Making a left turn with the top half of your torso pointing backwards is not natural. Sure, you’re going to do some minor shifting, but never so much that the judge does a double-take and says “Oh, my!” Teach yourself and your dog to rely on subtle shifts. Nothing glaring! As concerns the turns themselves and the distance you can allow yourself from the posts, a good rule of thumb is about an arm’s length away from the posts as you go around. There is no mention of any rule regarding distance from the posts that I can find. So that word ‘reasonable,’ a word highly esteemed by AKC, comes to mind. Make the distance reasonable, neither so wide that you lose sight of the posts nor so close that you risk intimacy with the ring steward. What you want is a comfortable distance for you and your particular size of canine pal. Be conservative but not stingy. In AKC halts during the Figure 8 are rarely given anywhere save between the two posts. I can’t tell you how many times I’ve heard a competitor complain that the judge stopped them during a turn, only to learn upon observation that the ‘halt’ itself was issued between the stewards, but the competitor continued to take 4-6 steps before finally stopping, thereby putting herself into the turn—and into a less than optimal situation. In all my years of competing in AKC I have never been given a halt while circling a post. Overall the judges are professionals and are very alert and attuned to the needs of the team. They are not there to trick you or set you up for failure. It’s just not on. The heeling pattern and “the Figure 8” are, as I mentioned earlier, scored as one exercise. An occasional lag or forge, a bump or unevenness in heeling will be scored, naturally, but not excessively; however, should your teammate decide not to budge from his comfortable set up, resulting in your dragging him around the ring while he burns his break pads, well then a Qualifying score just isn't going to happen that day. Always remember: overall what ultimately matters is teamwork!